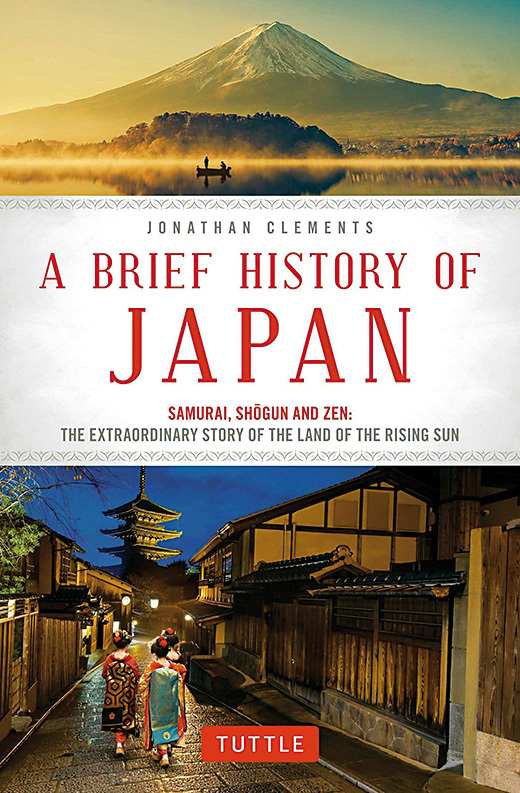 Jonathan Clements book is a tour de force, which summarizes all the key elements you need to understand Japan. Ask any class of Japanese high school students which is the most difficult subject on their curriculum and many will answer Japanese History. This is largely due to the endless litany of dates, names and battles they are required to memorize. It’s a pity, then, that they don’t have access to this little book, because it manages to make thousands of years of Japanese history both accessible and enjoyable. Japan’s history has always been a larger than life affair. From its mythical beginnings, through the divine kamikaze winds that saved it from Mongol invasion, followed by centuries of rule by emperors descended from the gods, right up to Hello Kitty, Abenomics, prefabricated pop stars and the rise of nerd culture in the wake of the 2011 earthquake disaster. It’s all here, in under 300 pages. Besides all the vital landmark events like the arrival of Zen or the 200 years of isolation, you’ll also encounter a wealth of fascinating but less well-known aspects. Who, for instance, were the Shrimp Barbarians? And why were they important? How about the Earth Spiders? Why do Japanese schoolgirls dress up as sailors? What are the origins of sushi? You’ll learn all the answers, plus everything else you need to know about Japan. Jonathan Clements is the author of several books on Japan, including Anime: A History, and Modern Japan: All That Matters. His face will be familiar to National Geographic TV viewers as the presenter of the series about Chinese historical icons, Route Awakening. Intended for the general reader, A Brief History zips along in a style that is both witty and informative. Clements peppers his text with contemporary reference points that help make ancient history more readerfriendly. He compares Heian-era writer Sei Shonagon (The Pillow Book) to a modern-day blogger, and says she and Murasaki Shikibu (authoress of the world’s first novel, The Tale of Genji) were “frenemies”. Similarly, Clements gives his chapters titles like Game of Thrones and, most inspired of all, The Empire Strikes Back (referring to the build-up to Pearl Harbour). Each chapter begins with a little vignette, often sourced from eye-witness accounts of key events, which bring each episode to vivid life. This is particularly true of the dramatic suicide of writer Yukio Mishima, or the touching aftermath of the history-changing battle of Sekigahara in 1615. Of particular interest are the revelations that trace the historical roots of present-day customs. Who knew, for example, that dividing teams into reds and whites in every competition from school sports days to the hugely popular New Year’s Eve TV song contest Kohaku Uta Gassen, dates back to the long-running medieval wars between the Taira (Red) and Minamoto (White) clans? Elsewhere, the chapter entitled The New Breed hurtles through Japan’s post-war resurgence, the years of boom and subsequent bust, at shinkansen speed. It’s an exhilarating ride into the heart of how Japan works, behind the facade of the economic miracle. Writing about the country’s vicissitudes, Clements manages to remain admirably non-judgmental, although he does paint a grim view of modernday Japan in the closing Cool Japan chapter. Artist Murakami Takashi, he notes, dismisses Cool Japan as “nothing more than ad copy to allow public funds to go to advertising companies”. Certainly, with its hordes of otaku (nerds), its hikikomori (nerds who never go out) and its greying population, the country is facing an uncertain future. Yet, as Clements observes, “Japan confounds all expectations. It never fails to surprise”. And therein lies one of the book’s big take-home points: Japan’s perennial capacity for reinventing, adapting, innovating and, above all, fascinating. Marco Polo once claimed that “in Japan they have gold in abundance, because it is found there in measureless quantities”. The First Emperor of China was drawn by reports describing Japan as legendary isles populated by immortals. Today, we no longer believe such tall tales. Instead, today’s Marco Polos return with accounts of a fabulous land where people are always polite, streets are clean and safe and convenience stores really are convenient, while the welcoming glow of vending machines beckons from every corner. We no longer expect to find gold, but are instead enticed by J-pop, Zen, robots, automatic toilets, public-mindedness, anime, manga, cosplay and gadgets galore. The details have changed, but Japan still elicits the same mix of admiration and awe. With the current swelling of interest in all things Japanese, and inbound tourism reaching record levels in the run-up to the 2020 Olympics, this book couldn’t be more timely. Whether you’re a long-term Japanophile, or an armchair traveller with Japan somewhere on your bucket list, this book will help you understand how Japan became the fascinating unique place it is today.